With captivating narrative and insightful commentary, labor organizer Jonathan Rosenblum reveals the inside story of the first successful fight for a $15 minimum wage, which renewed a national labor movement through bold strategy and broad inclusiveness. Just outside Seattle, an unlikely alliance of Sea-Tac Airport workers, union and community activists, and clergy staged face-to-face confrontations with corporate leaders to unite a diverse, largely immigrant workforce in a struggle over power between airport workers and business and political elites. Digging deep into the root causes of poverty wages, Rosenblum gives a blunt assessment of the daunting problems facing unions today. 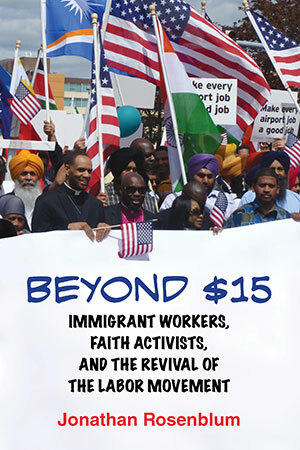 Beyond $15 provides an inspirational blueprint for a powerful, all-inclusive labor movement and is a call for workers to reclaim their power in the new economy. —Hedrick Smith, author of Who Stole the American Dream?